02.19.2004 - This gift store in Orlando, on International Drive, had a pigeon problem. The pigeons were roosting on the steel beams that held up the decorative (not functional) Space Shuttle. This of course means that they pooped all over the ground below this area, right near the front door. Thus, all of the customers who entered the store had to walk through pigeon poop to do it. Patronage was dropping. Sales of gifts were dropping. Profits were dropping. All because pigeon droppings were dropping. So, the owners called me and asked if I could make the pigeons go away. I said that I could. This was my first major pigeon job. The plan was to cover all of the steel beams with bird spikes to prevent the birds from roosting there. I quoted it at $450, and the store managers accepted the bid. I did all of the measurements and bought the necessary linear footage of steel bird spikes. The materials cost was $350. I performed the work in one day. I used a 40' ladder to access all of the beams behind the shuttle. The job was very challenging. I had to reposition the very heavy ladder dozens of times and at some difficult and dangerous angles in order to get to all of the steel beams. I carefully cut the needle strips to the proper lengths and affixed them to the beams with a very powerful bonding glue and steel ties. 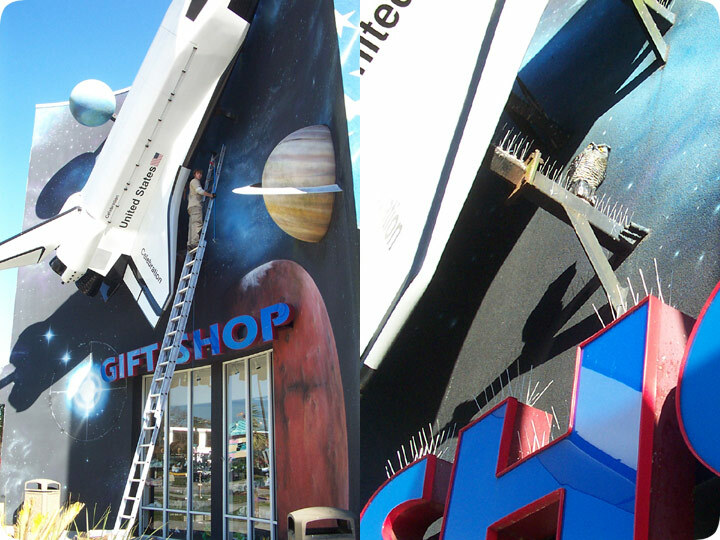 I covered all of the beams and the "Gift Store" sign below the shuttle. It was a difficult and dangerous job, but I did great work. The pigeons were no longer able to roost on the beams, and I solved the problem. Do it yourself: Visit my How To Get Rid of Pigeons page for tips and advice.